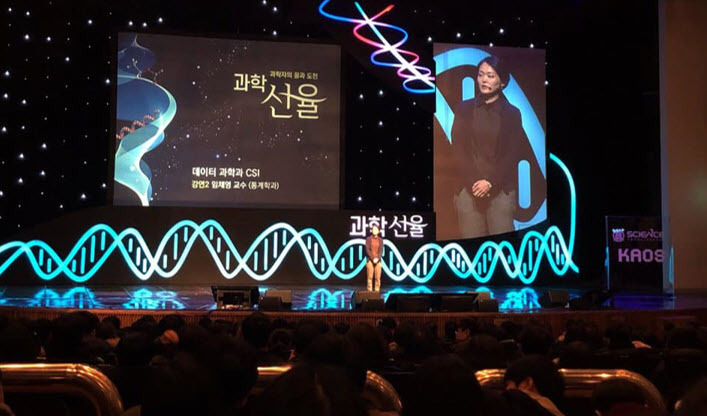 First hosted in 1994, the Natural Sciences Open Lecture is a series of public talks that strives to contribute to the development and popularization of the natural sciences and raise awareness of the current challenges facing Korean society. This year, more than 1,500 people from all over the country participated in the event. This year’s lectures included: “The Battery of Love: A Collaboration of Electricity and Chemistry” by Professor Chung Taek Dong (Department of Chemistry), “Data Science and CSI” by Professor Lim Chae-young (Department of Statistics), “The World of Waves: From the Violin to Gravitational Waves” by Professor Seonho Choi (Department of Physics), and “The Musical Notes of Life: RNA” by Professor V. Narry Kim. In particular, an interview session hosted by Professor Kang-kun Lee (School of Earth and Environmental Sciences) with four North Korean scientists was highly acclaimed for its interesting discussions on themes such as “The Life of a College Student in North Korea” and "The Scientists of North Korea." The College of Natural Sciences continues to host a number of programs that provide easy access to scientific knowledge for students and the general public. Other events include Saturday Science Open Lecture, in which lecture and discussion courses on different topics are held for middle and high school students, and the Natural Sciences Experience Camp, which gives people the opportunities to explore different fields of natural sciences first-hand. Through these events, the College strives to continue serving as a link between the scientific community and the general public.